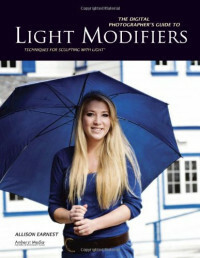 Focusing exclusively on light modifiers and making the most of the least equipment, this in-depth handbook is ideal for use by the beginner and advanced amateurs who wish to take their photography to the next level. Including diagrams and lighting set scenes to facilitate learning and adapting technique, step-by-step critiques of several portrait sessions, and an extensive review of a variety of light modifying tools—from barn doors and snoots to gels, umbrellas, and strip boxes—this invaluable textbook style book reveals the precise steps for obtaining dimension and depth for indoor and outdoor portrait sessions. This resource is a must-have for beginner photographers looking to discover a treasure trove of fresh, creative lighting inspiration, that will surely help add diversity and creative style to your photography.